The doctor told her the about ordinary RO Purifier reduce the minerals from water and she need a Blue Mount Alkaline RO water purifier, which adds minerals to the water. 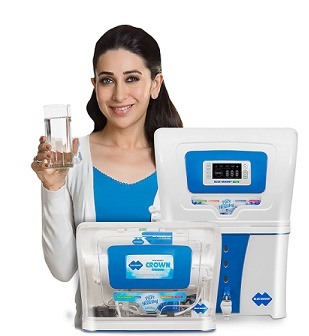 In recognition of her undeniable talent, immense popularity and her motherly look, Blue Mount Alkaline RO has named Karisma Kapoor as their brand ambassador. She features in the new TVC announcing the launch of Blue Mount Alkaline RO with LED Display. The new 50 secs TVC featuring Karisma Kapoor, who was worried about her son on his frail health and was consulting with doctor on the same. The doctor told her the about ordinary RO Purifier reduce the minerals from water and she need a Blue Mount Alkaline RO water purifier, which adds minerals to the water. Blue Mount Alkaline RO water purifier maintain the pH level and balance high acid level in times of stress, lack of sleep and over consumption of acidic foods such as processed food & keep your body energized for a longer duration of time and makes you feel fresh and remain healthy. Keeping the same in the mind Blue Mount Alkaline RO launched its products with a slogan of “Sabse Pure, Sabse Healthy”. The film has been created by Excl Advertising and narrates the story of a mother whose kid is ill after the using of RO purified water. Sandeep Singh, National Creative Director, Excl Advertising Pvt. Ltd. said “We are happy to be part of this venture and will look forward to such creative briefs in future from Blue Mount’.